Choosing a cultural idol to venerate was quite simple if you were part of the merchant class in Edo-period Japan. Sure, one might look up to one of the behemoths of the sumô ring, or feel momentarily weak-kneed at the sight of a celebrated geisha, but such icons were distant and unapproachable for most of the citizenry, and their careers short-lived. Instead, your idolizing energy would most likely be focused on an actor or two from the kabuki theater, the steady source of darlings for the urban class to adore. Actors not only possessed the panoply of talents prerequisite for a life in kabuki — disciplined intelligence, superb voice control, graceful athleticism — but also their renegade lifestyle and sly ad-libs on stage represented an irresistible hint of subversion in otherwise tightly-controlled Tokugawa society. And, critical for building long-term allegiance, they were famously available to their fans. The more popular actors you could follow from your theater seats throughout the long season, of course, plus woodblock prints — priced the same as a bowl of noodles — publicized them on a regular basis, both in and out of costume. But more importantly, if you had the financial means or were a member of a well-organized fan club, you could count on the chance to sit on an adjacent zabuton to your hero at any number of private parties. What made these parties such attractive affairs — and ratcheted fan respect up yet another notch — was that actors were accomplished in arts not directly related to kabuki. Thus, in addition to the charismatic aura of your idol, you could expect to spend the evening soaking up his singing, his poetry writing, or his skills in calligraphy and black ink brush painting. These were the hobbies of choice for many gentlemen-merchants, but actors were famously adept at them. Sumi-e painting by the actor Matsue? Which brings us to the print illustrated. It is by the Osaka artist Kunihiro (active 1816-41) and it depicts the actor Nakamura Matsue III (aka Tomijûrô II) in a role from 1824. Hard to ignore in this composition is the free-standing screen (tsuitate) showing a monk on a pilgrimage watching a bird fly off. In sharp contrast to the black outlined, boldly colored and patterned figure of Matsue with a writing box, the austere, monochromatic " sumi-e" painting on the screen calls to mind another world ... or at least another school of art quite alien to the mood of ukiyo-e. Such juxtapositions are occasionally met in woodblock prints, especially those published in Osaka, which was situated so close to the influential painting academies of Kyoto. 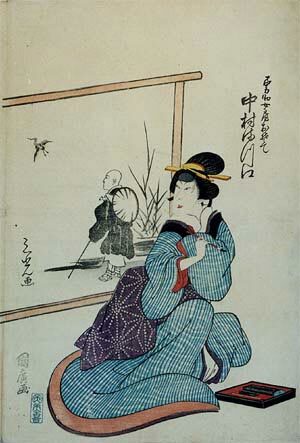 Having a part of one's composition executed in the Shijo or Nanga style was perhaps a way for a frustrated print designer to prove that he was capable of more than merely working in the paint-by-number regime of ukiyo-e. Then again, it was also an opportunity for the carvers and printers to show off as well. In this case, however, the painting within the print is signed 'Sankô', one of the artistic names (haigô) used by the actor Matsue. This suggests that it was the thespian, not the print designer, who contributed the sumi-e, leaving unanswered whether the screen appeared as a prop on the actual stage, or it was introduced into the ukiyo woodcut as a bonus for Matsue's fans. This article originally appeared in Daruma, no. 24, Autumn 1999. Copyrighted © text and pictures reprinted with permission.